Since underground mines cannot be seen, utilizing the existing underground maps is the only practical way of mapping them. These maps are the foundation of the Underground Mine Mapping Project. 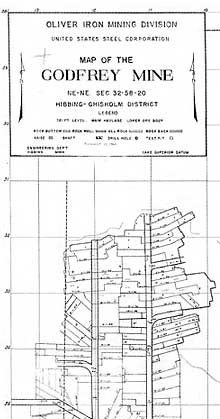 Underground mine maps were obtained from government agencies, mining companies, and private fee representatives. Contributing entities included Minnesota Department of Natural Resources Division of Lands and Minerals (MNDNR), Iron Range Research Center (IRRC), Minnesota Department of Revenue Minerals Tax Office, the St. Louis County Inspector of Mines, Hibbing Taconite Company, U.S. Steel Keewatin Taconite, U.S. Steel Minntac, United Taconite, Cliffs Natural Resources, Arcelor Mittal, Eveleth Fee Office, Great Northern Iron Ore Properties, Meriden Engineering, RGGS, Department of Interior Office of Surface Mining, and the public. Over 3000 mine maps were scanned using the Hewlett-Packard designjet copier cc800ps and the designjet 820mfp copier/scanner. The scanners were set with parameters that would give the best resulting scan and minimize the file size for each map. Scans were done with a minimum of 200dpi and a maximum of 600dpi. Black and white scans were done when possible. Color scans were generally converted to grayscale with Adobe Photoshop to reduce file size. Final scanned images (TIF's and JPEG's) were combined by mine and converted to Adobe PDF format with the original image name as a bookmark. The PDF files were then down sampled to as much as 50dpi for use on the internet. The higher resolution PDF files are available from the DNR Division of Lands and Minerals, 1525 3rd Ave East, Hibbing, MN 55746 218-231-8484. All maps are in Adobe PDF format.